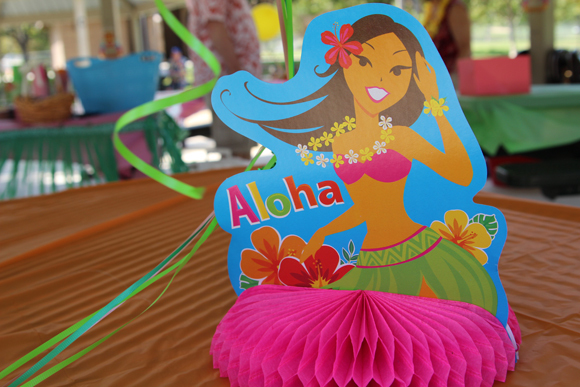 Because I like to drive myself insane and self serve a sizzling hot plate of fresh, homemade stress, I decided to do a few DIY projects for Madelyn’s birthday luau. 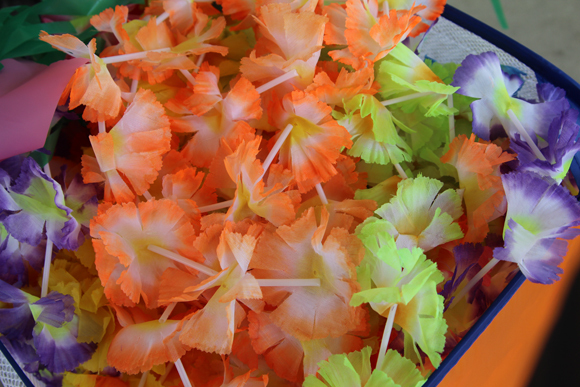 I allowed the 99 cent store to provide table accessories like table cloths and centerpieces and I had leis for everyone to wear when they arrived, but I got crafty in other areas like signage, party favor name tags, fruit skewers and the ball pit. I wanted a sort of activity for the grown ups to participate in so I set up a makeshift “photobooth.” It didn’t look super professional or high tech and I didn’t intend for it to be. After all, it was just a one-year-old’s birthday party. 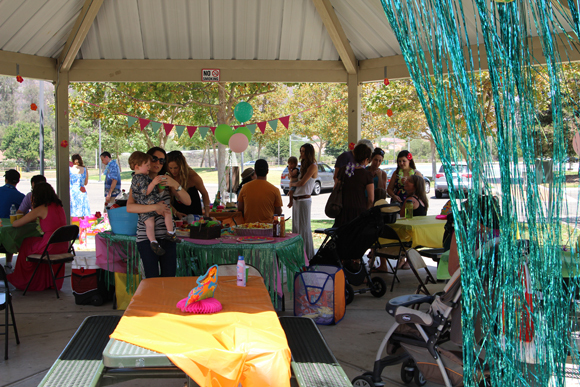 I bought metallic streamers and an ALOHA banner on Shin Digz to hang from the ceiling of the gazebo. Unfortunately, the wind blew it in crazy directions so the streamer curtain hardly ever hung straight and still when guests stood in front of it for pictures. Good job, WIND. Bryan attached our point-and-shoot on a tripod and put it on the automatic self timer setting, and thanks to the directions I made on a sign, the hope was for people to press the button, run into the shot, and pose! Thankfully, it worked out pretty well! We got some great shots! 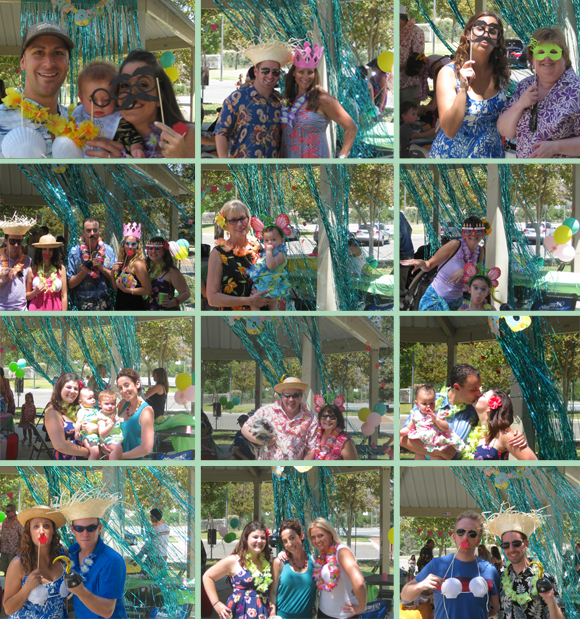 I’ll email the photos to everyone so they have a takeaway — albeit, tardy — from the party. I collected props from various different stores and recycled paper face props on sticks from my friend Dana’s 30th birthday party (thanks, Dana!). 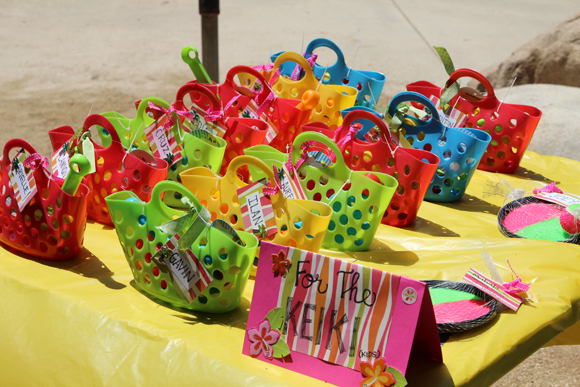 I knew I wanted to do fun and colorful party favors for the kids so I found a little sand toy kit that looked great displayed on a table for the young ones and tennis ball and velcro paddle kits for the school aged ones. 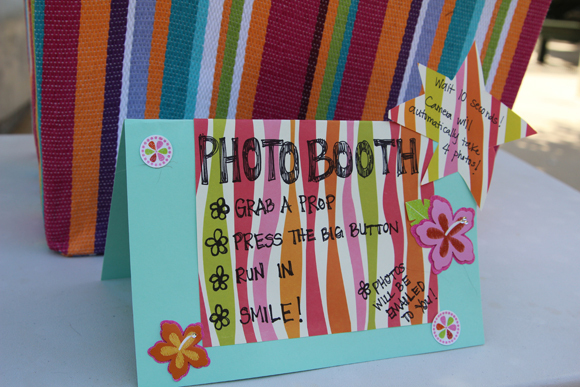 To Hawaiian-ize them, I made personalized name labels with cardstock and rainbow zebra stripe paper. I used a thin Sharpie marker to write their names and the finishing touch was a sparkly palm tree next to the name. 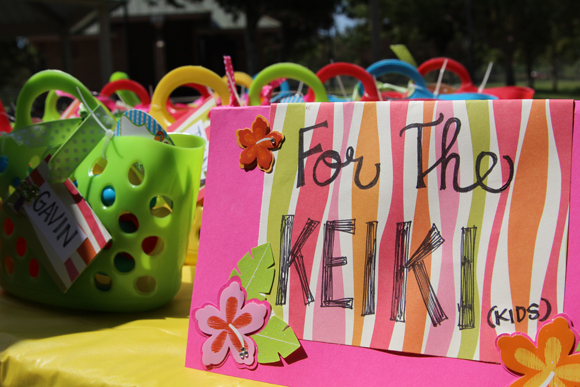 I made a complementing sign with the same paper that said FOR THE KEIKI to tie in some Hawaiian language. Had to make sure the adult guests knew these goodies were for the kids and not them! I mean, doesn’t every grown man want a plastic shovel and rake in a basket purse? No? A normal, sane person who had a huge party to throw and a to-do list a mile long would make the intelligent decision to buy a bunch of cut up Costco fruit and toss ’em into a bowl for a fruit salad. 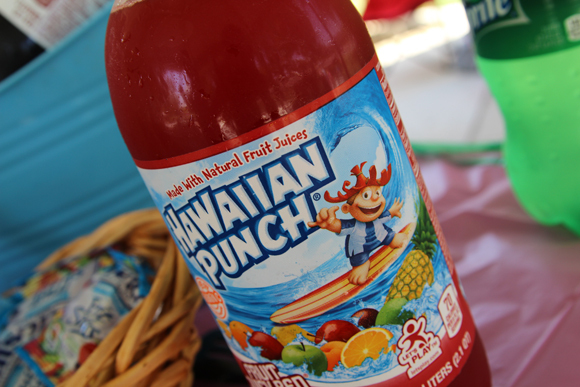 But because I am neither normal or sane, I bought that fruit — oh I bought it! 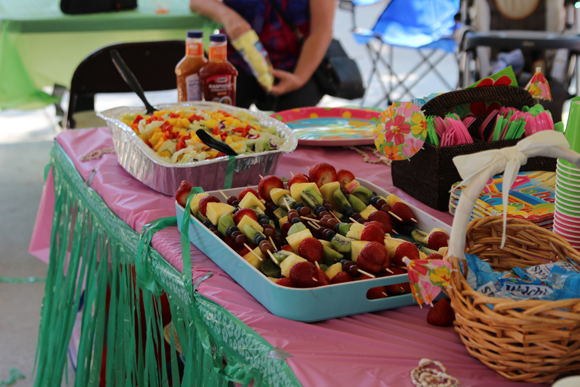 — and then my fruit sous chef/mom helped me cut them up and assemble them on skewers, in rainbow order, no less, to create a dual purpose side dish/Hawaiian themed decorative pop of color on the table. Was it worth it? 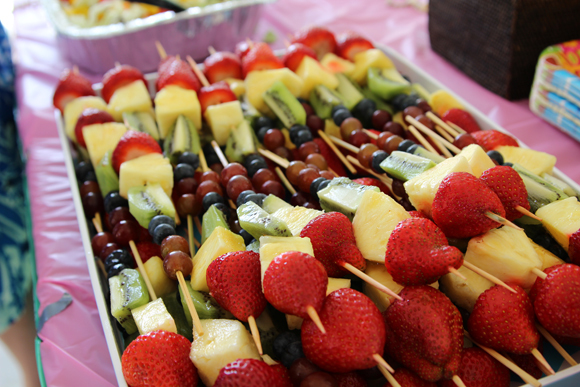 Well, there were 3 skewers left by the end of the party. We started with — wait for it — 73. So, Bryan and I thought about having a baby pool at the party because we knew it would be hot — oh and it was! The sun made good on its August promise — but deep into the party planning, I had visions of a scene” frameborder=”0″ allowfullscreen> out of The Sandlot when Squints falls to the bottom of the pool and in need of swim assistance, and unfortunately, this party wasn’t employing Wendy the Lifeguard to pull out nerdy boys and give them mouth-to-mouth. 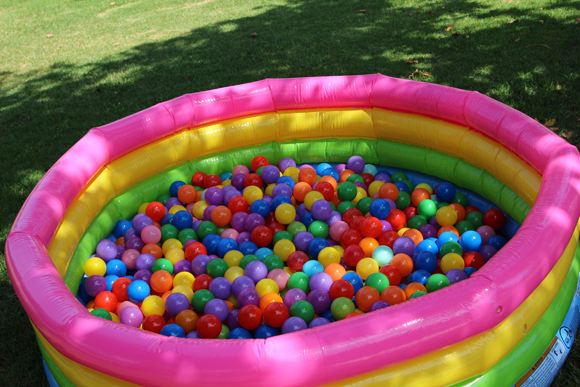 So, if the pool couldn’t have water in it, it would have the next best thing: balls. 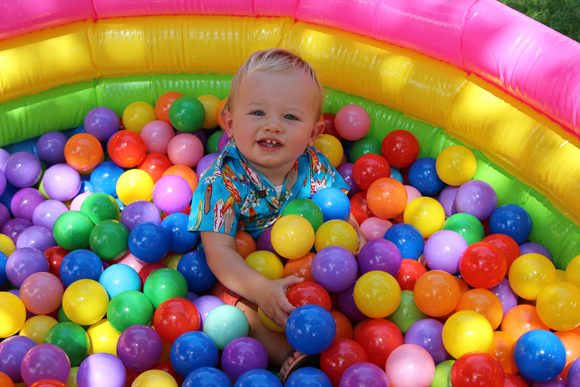 Thanks to Amazon, I found really quality and colorful balls to fill up the pool so nearly 1000 balls later, I was so excited to see the babes pile in and have a good time. They did! Who wouldn’t, really? 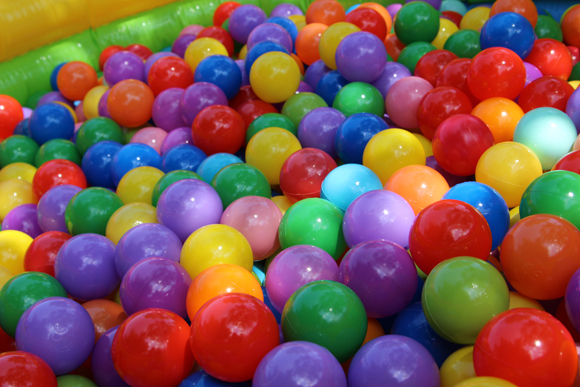 I actually wouldn’t know because as a small child, I was never allowed in the ball pit at Chuck E. Cheese “because it was filled with germs of strange, icky-pooey children.” But our own private ball pit with prescreened clean children? Score. 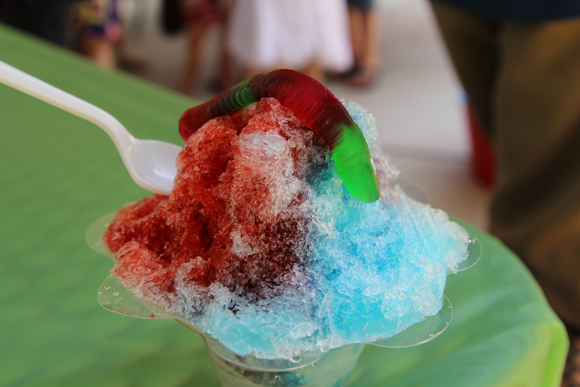 The shave ice hut did a great job tying in the theme of the party just by being there! The look and taste of the islands were very present and it was definitely my favorite part of the plans that came together. All the pre-party work and early morning set up were totally worth it! It was stressful for the weeks leading up to the party to have everything I needed but couldn’t “rehearse” the set up before the actual big day since the party wasn’t in our home. 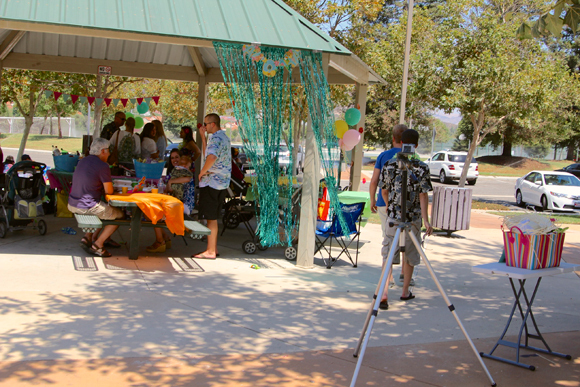 But it all came together so smoothly and I enjoyed myself when all of our guests were there to celebrate Madelyn! I know Madelyn won’t remember this party, and she’ll have a few more parties until she starts to have memories of birthdays, but the first birthday party seems like a big deal to me and something I enjoy looking at in my own baby book. We’ll always have the pictures — and the blog! 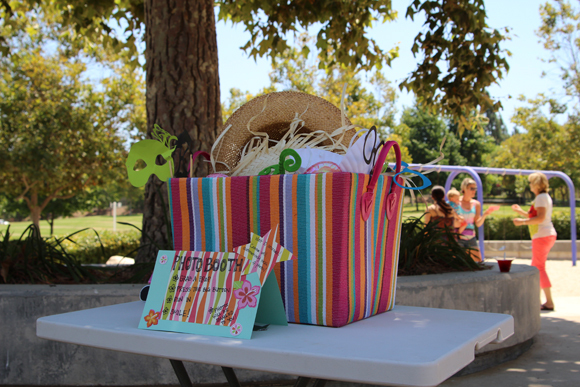 — and I’m glad we created a special event that Madelyn will be able to go back and revisit and enjoy.